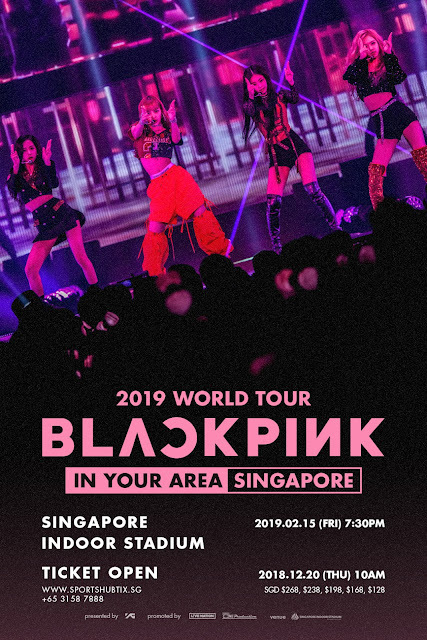 BLACKPINK 2019 WORLD TOUR <IN YOUR AREA> in SINGAPORE on 15 February 2019 at the Singapore Indoor Stadium! With best effort from each members the show will be fulfilled with various stages. BLACKPINK will perform not only their hit-songs but will also perform remix version and solo stages. BLACKPINK is going to perform 8 shows in 7 cities in 2019 including Bangkok, Jakarta, Hong Kong, Manila, Singapore, Kuala Lumpur Taipei and more shows will be revealed. *Soundcheck Party: CAT 1 ticket holders who purchase tickets before 11th February are eligible for a lucky draw to attend the BLACKPINK Pre-show Soundcheck Party. Winners are announced on Live Nation and One Production.